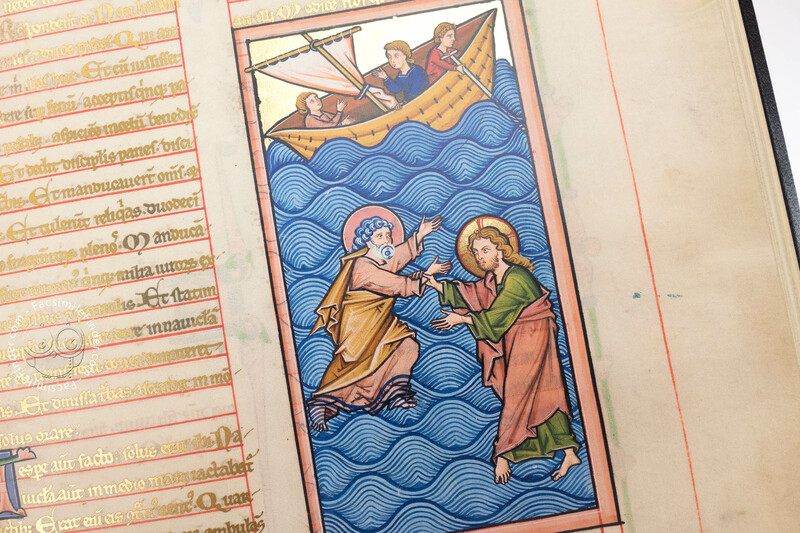 The cultural and economic heyday of the Archbishopric in Mainz gave rise to what was perhaps the most significant work of 13th-century German painting - the Mainz Gospels, created around 1250. 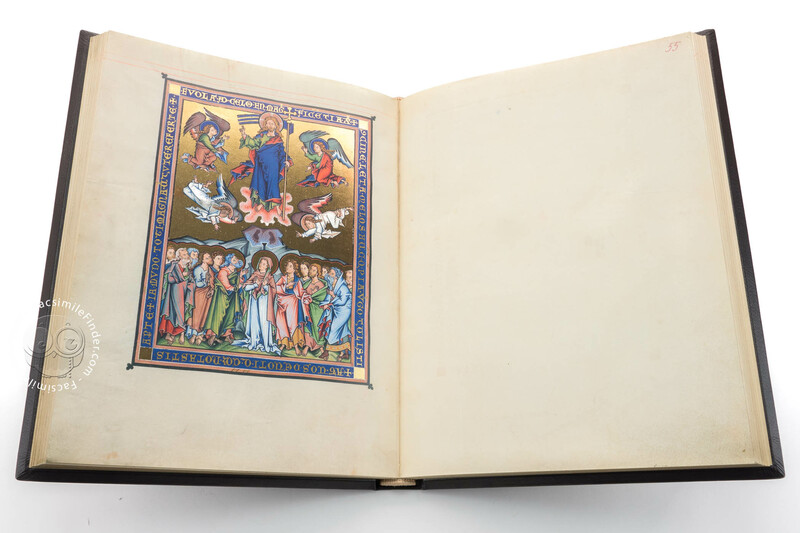 The identity of the patron who ordered this Gospel Book of unparalleled luxury is today unknown. 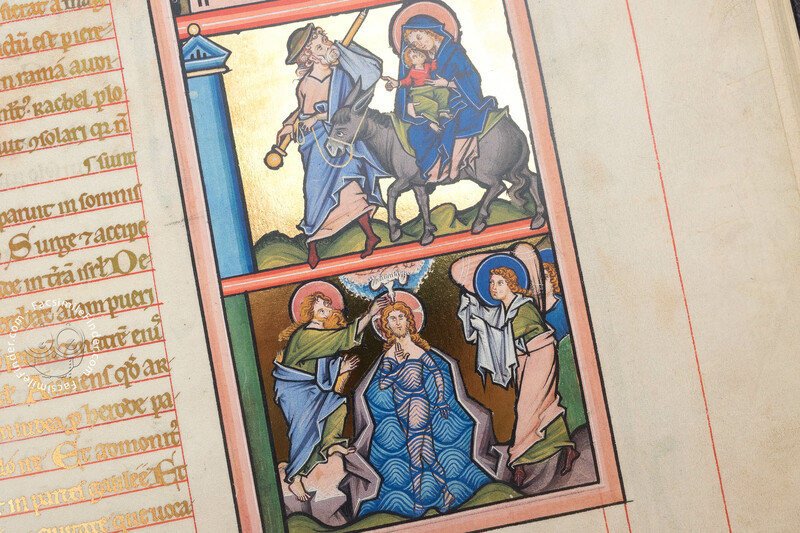 Its outstandingly precious decoration, however, suggests that the unique manuscript was either created on commission by or destined for the powerful Archbishop of the cathedral town on the Rhine. 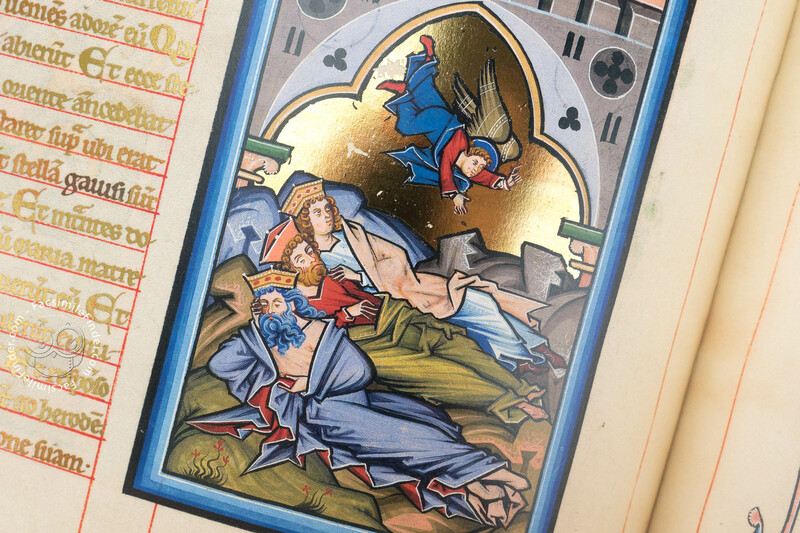 Over the centuries as part of the Mainz cathedral treasure, the Mainz Gospels have been preserved in the Hofbibliothek Aschaffenburg since 1803. The Mainz Gospels comprise the four Gospels of the New Testament according to Matthew, Mark, Luke and John in one volume. 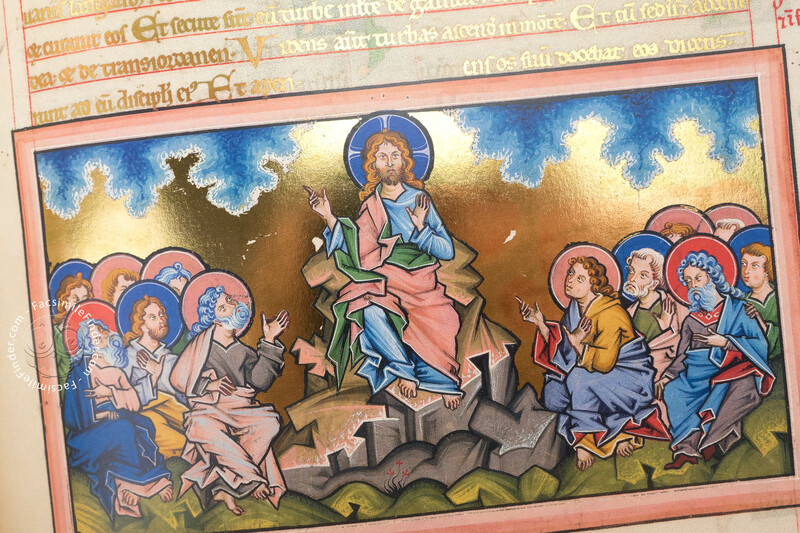 The entire Gospel text was copied in pure gold ink, as a sign of highest regard. 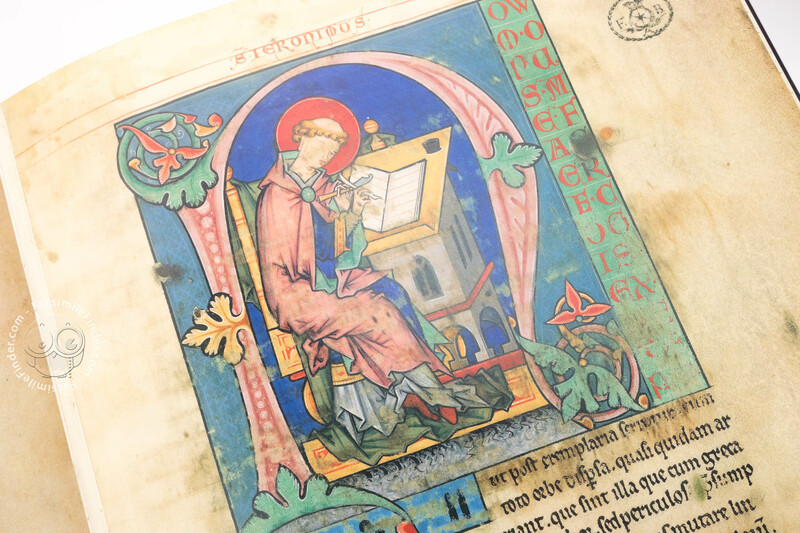 Only those entries that were not deemed to be saintly writings, such as the Canon Tables and the Gospel Prologues, are written in black ink. 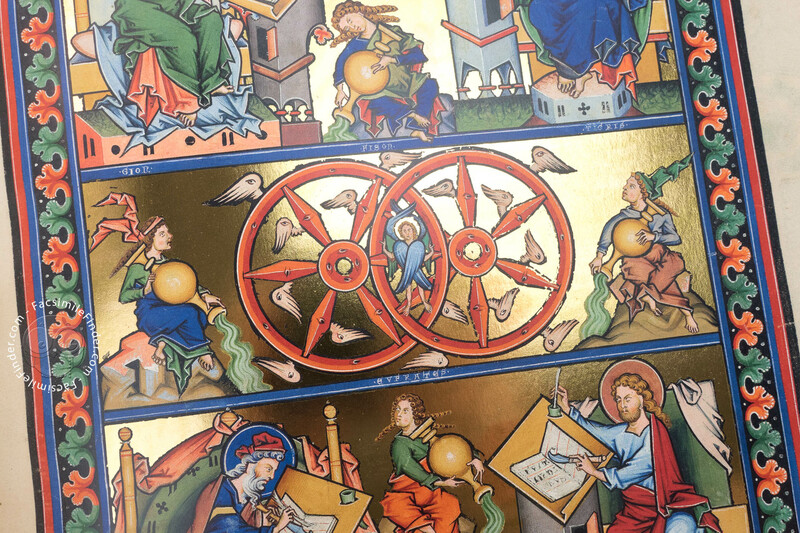 A codex aureus (Latin: golden book), this valuable manuscript follows the imperial tradition of the golden Gospels from the Carolingian and Ottonian periods and occupies a special position among 11th to 13thcentury manuscripts. 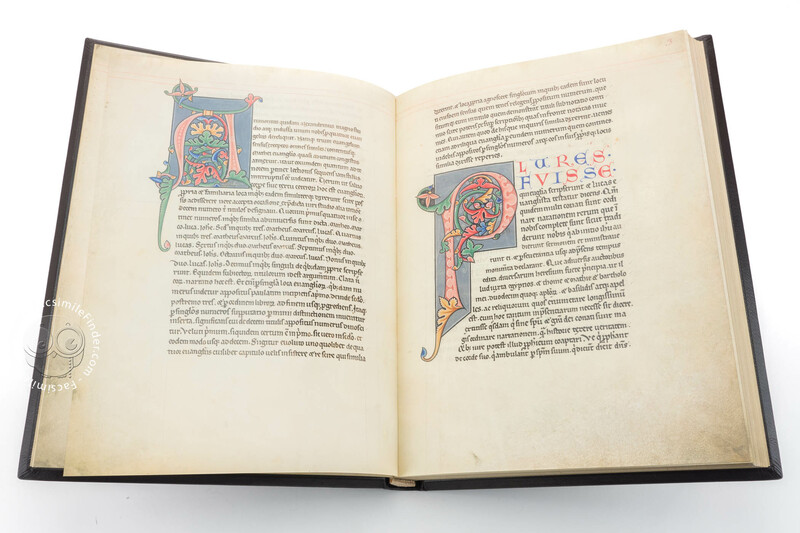 The so-called textura script, in which the Mainz Gospels are written, is today considered to be the most sophisticated calligraphic script of the Gothic period. Its equal spacing between the words and careful duct provide for both good readability and an attractive overall appearance. 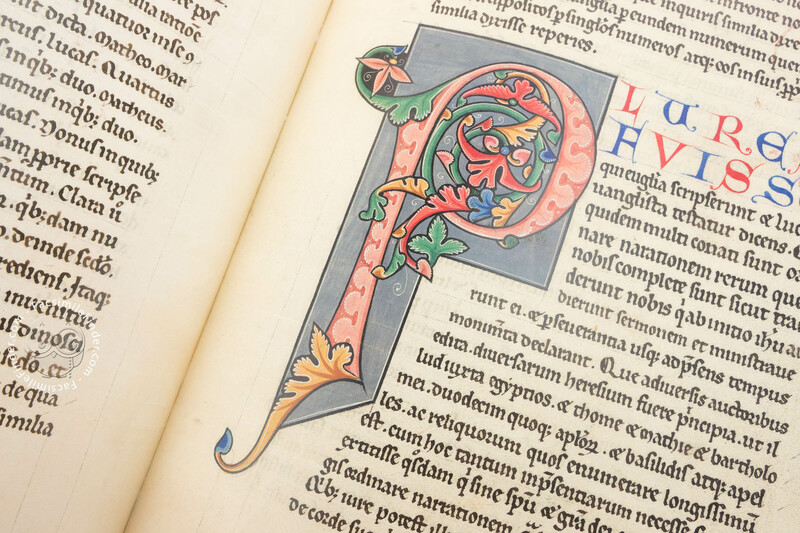 Textura was also the model for Gutenberg's movable type. 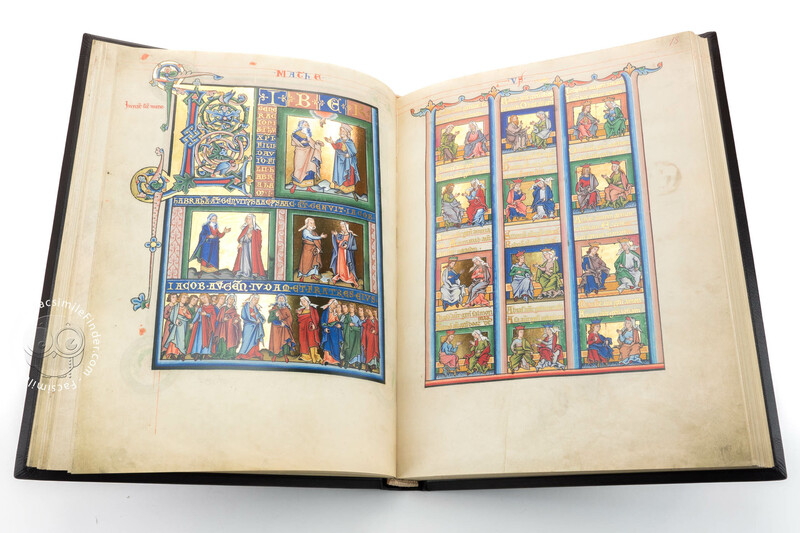 In a virtuoso picture cycle the anonymous master created 71 individual images and sometimes full-page miniatures to illustrate the New Testament. 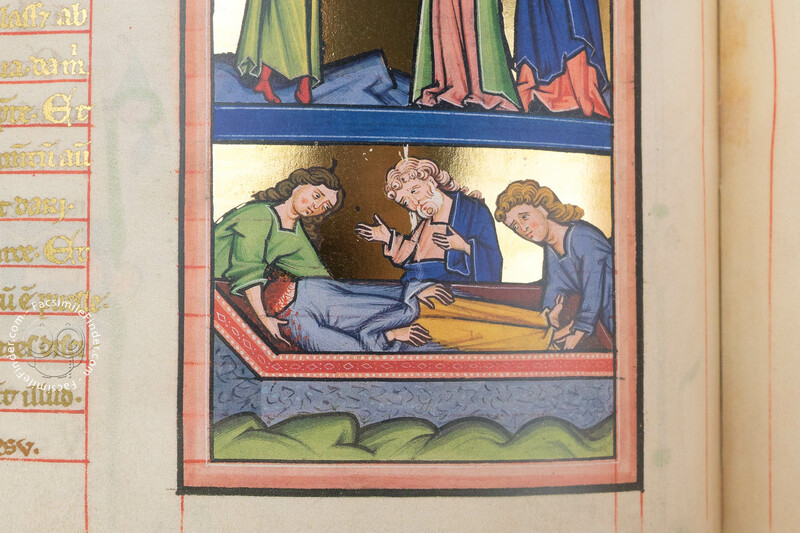 A unique feature of 13th-century art is the wealth of images illustrating the Life of Christ: the Infancy, Miracle-Working, Passion, Dying on the Cross, Lamentation, and Resurrection are largely depicted on impressive golden grounds and in vibrantly glowing colours. 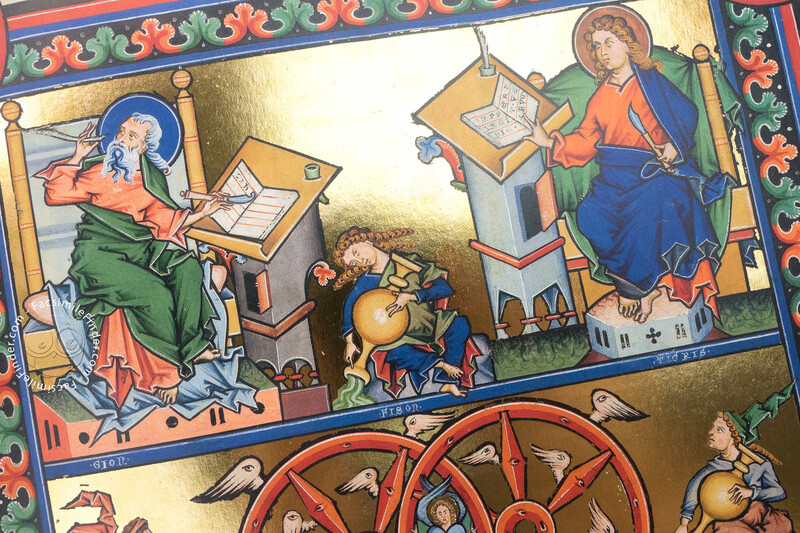 The influence of Christological picture cycles seen in the 10th and 11th-century manuscripts from Reichenau and Trier-Echternach is still strongly felt in these pictures. 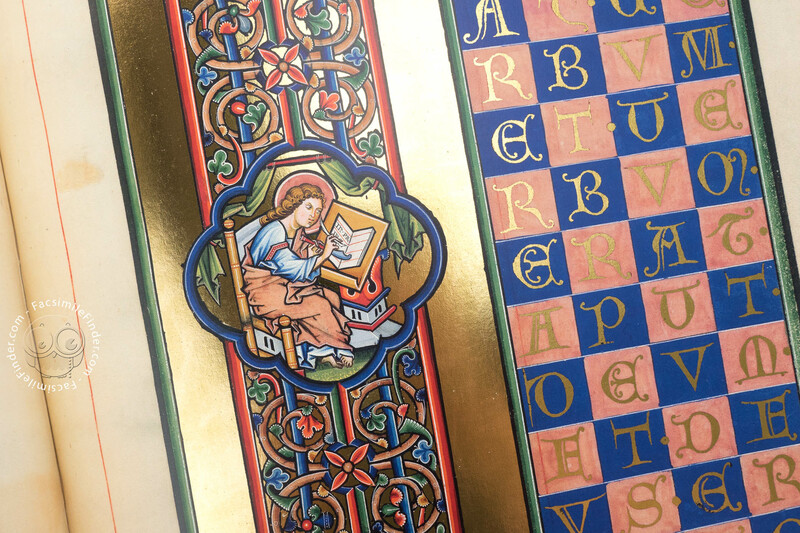 The large ornamental initials of the Canon Tables extend over several lines as well as 300 multi-coloured small decorative initials adorn the 100 manuscript leaves in the representative format of 35.3 x 27 cm. 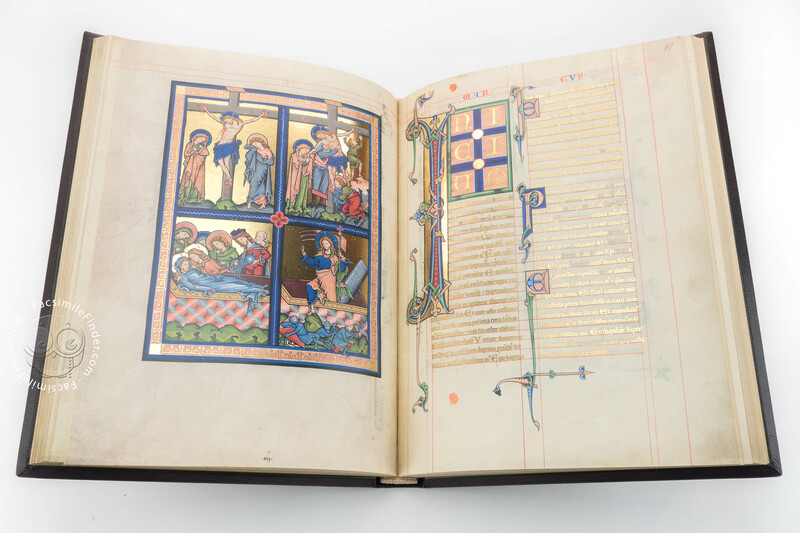 Influenced by the arrival of Gothic architecture in France, the Zackenstil, a distinctive variety of the Gothic figure style – so-called because of the jagged, angular broken drapery –conquered German book illumination during the 13th century. 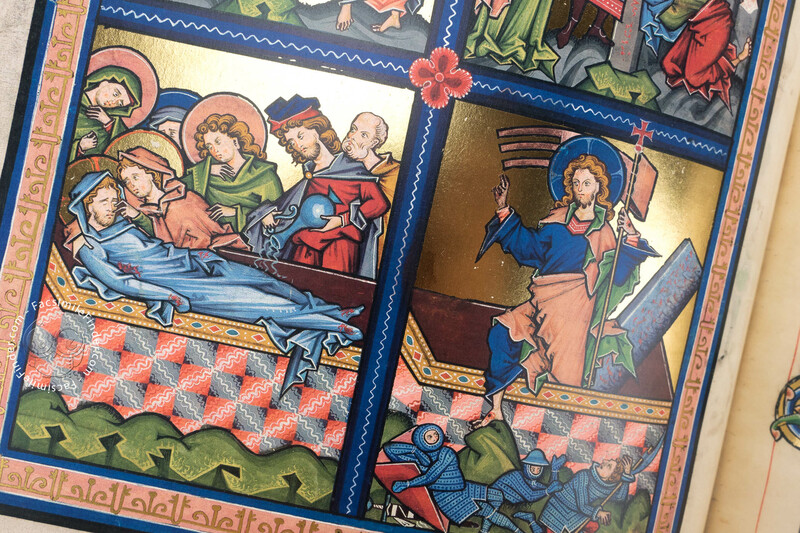 The growing competition between sculpture and painting in medieval cathedral architecture may have decisively contributed to the formation of this new style. Whereas in Romanesque art the horizontal line was the distinctive spatial dimension, the Gothic style is dominated by the vertical line. Forms now tend to reach toward the sky and, unlike in previous styles, appear clear, transparent, and dynamic. 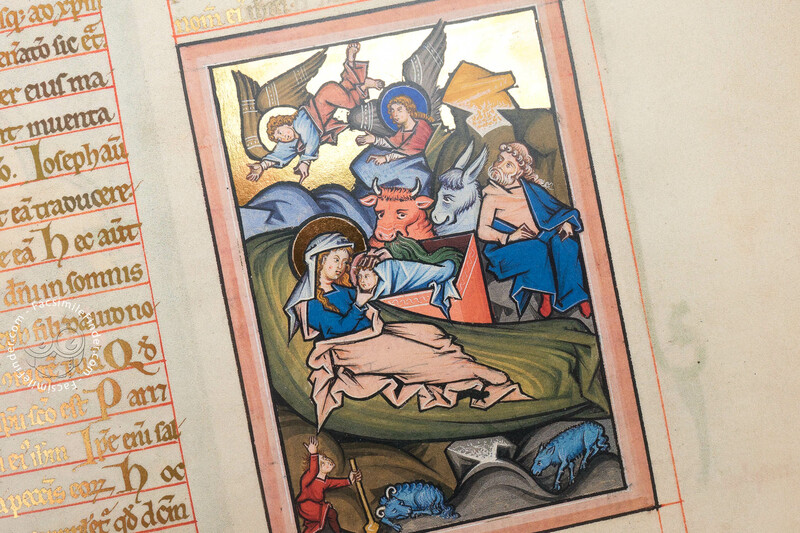 The Gothic formal vocabulary is based on the conviction that spiritual truth is made visible by beauty. The sometimes overly sharp contours of the Zackenstil result from the wish to confront religious sculptural art with an equally expressive and vivacious art form. Byzantian influences in the figural design fuse with new impulses from France to create a moving expressiveness and a three-dimensionality of almost relievo quality. 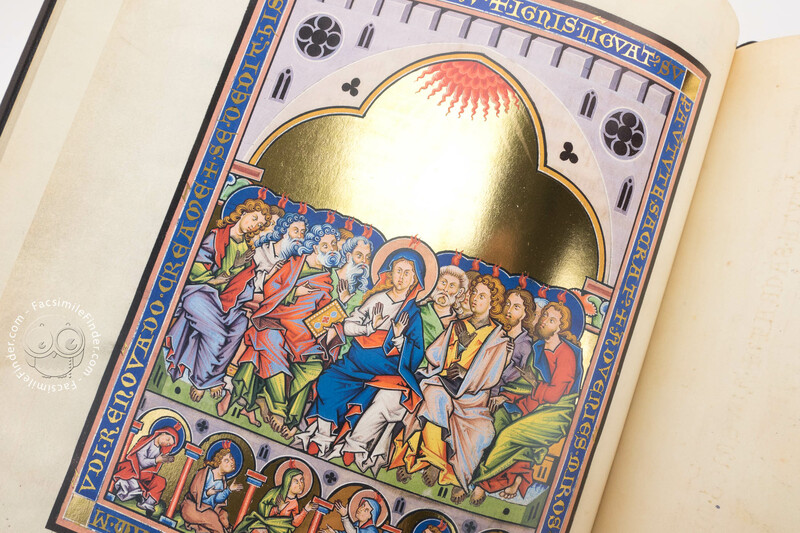 Rivalling with the evenly golden texture of the script, the charming miniatures glow in brilliant colours that are easily comparable with colourful church frescoes or the luminosity of glass painting. 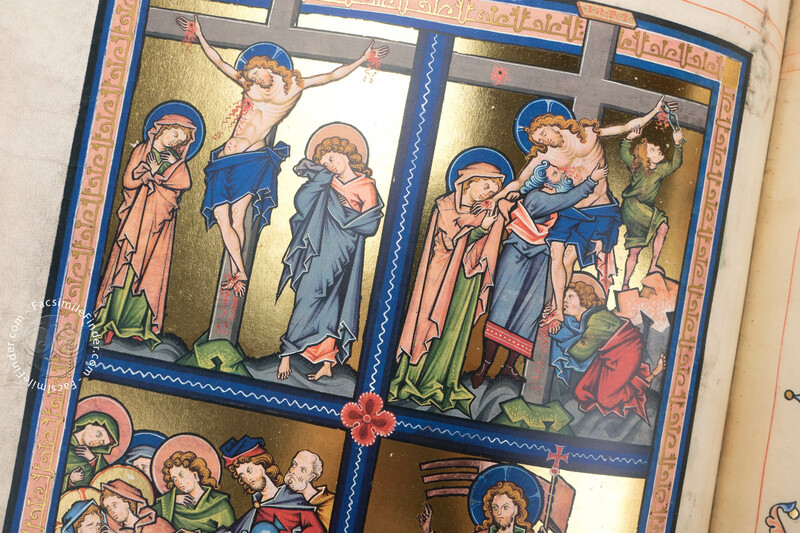 Like a church window flooded with light, the strong colours of the pictorial and decorative elements glow intensely on the sheer eye-dazzling golden grounds. Deep red, green, and blue pigments in addition to pastel-like shades in light blue, pink, purple, and violet lend both images and initials a precious and well-balanced appearance. 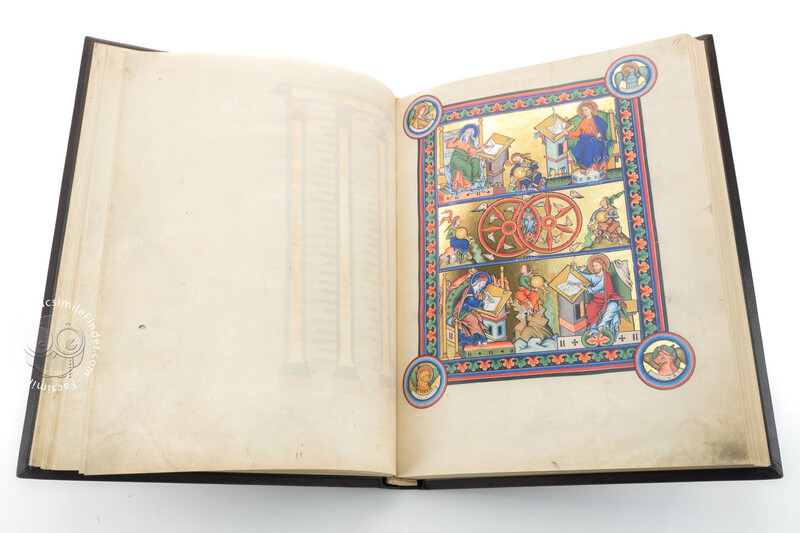 Manuscript book on parchment − 35.3 × 27 cm − 200 pp. 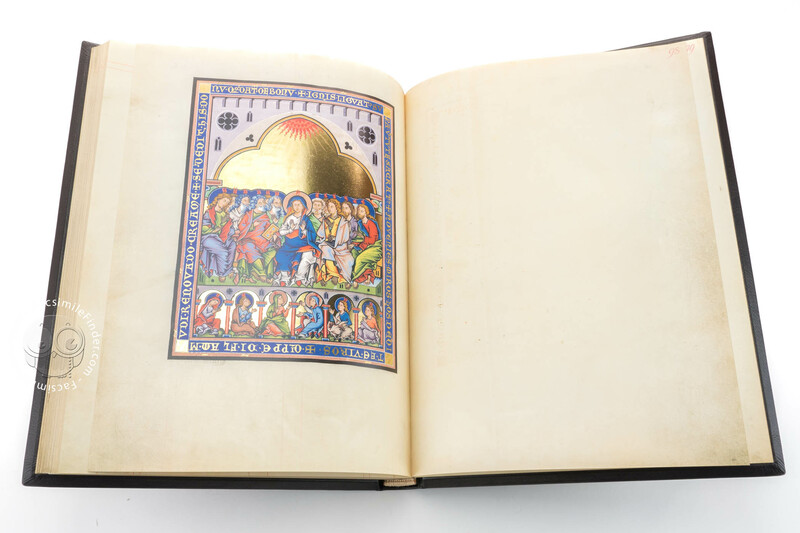 Full-size color reproduction of the entire original document, Mainz Gospels: the facsimile attempts to replicate the look-and-feel and physical features of the original document; pages are trimmed according to the original format; the binding might not be consistent with the current document binding. 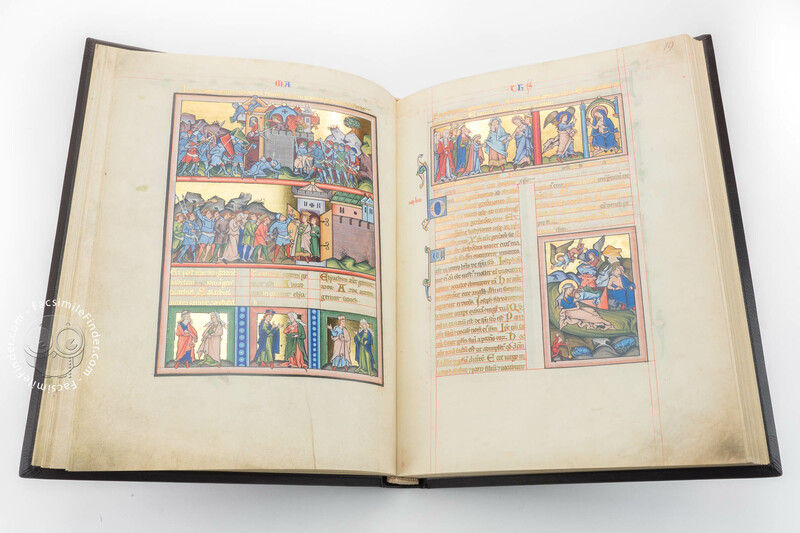 The scholarly commentary volume to this facsimile edition presents the manuscript within its cultural-historical environment at the time of its production. 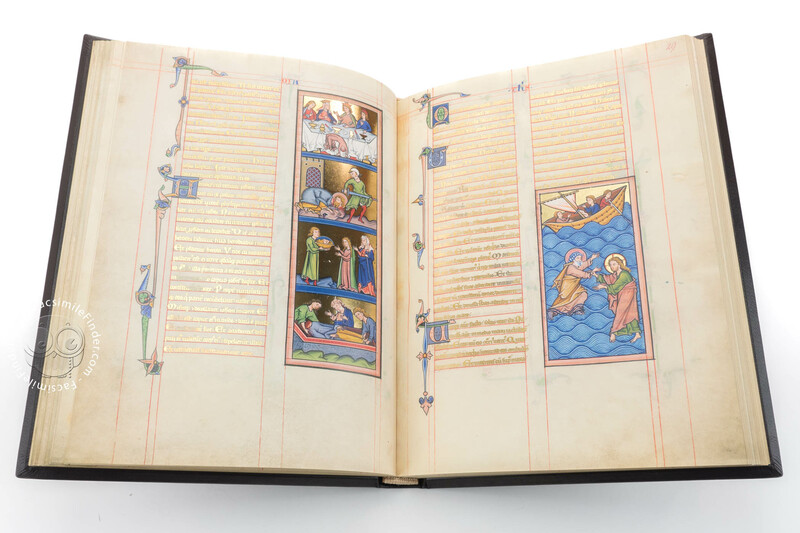 A detailed description of the miniatures and illumination elements is also provided. 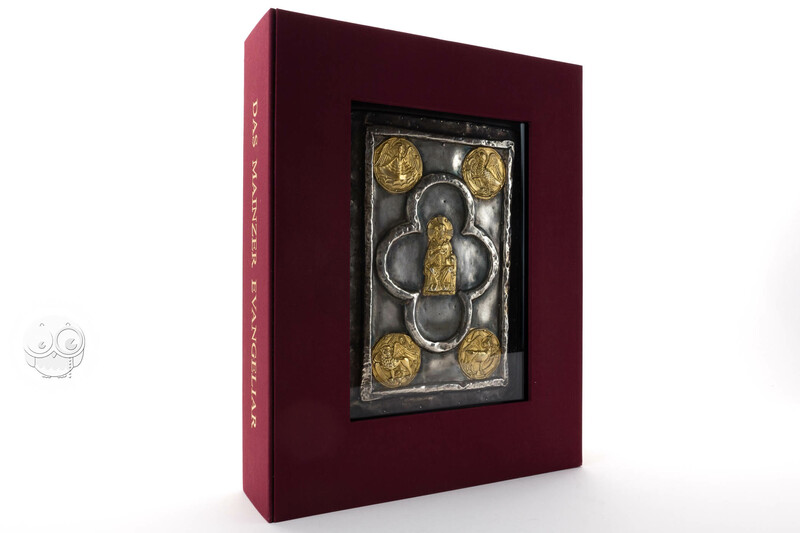 Facsimile and commentary volume are delivered in a decorative burgundy velvet case. 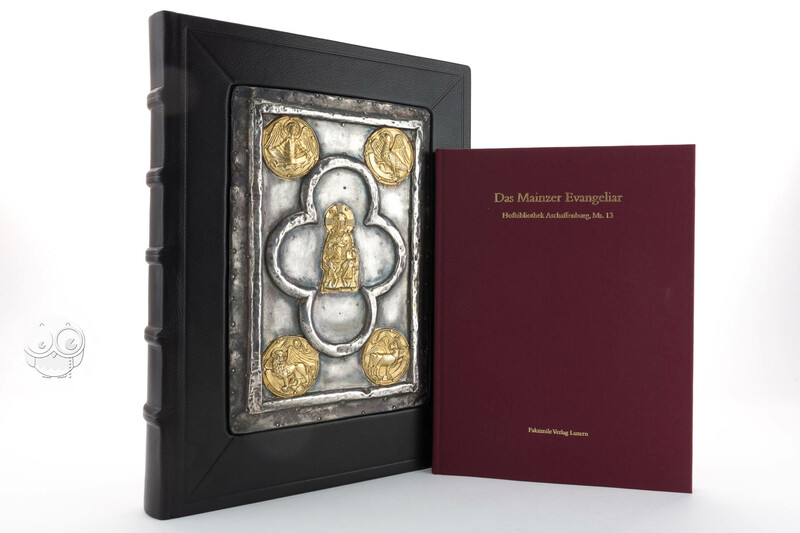 The binding is modelled on the equally 13th-century Preetz Evangeliary, a worthy replacement for the original binding of the Mainz Gospels which is now lost. 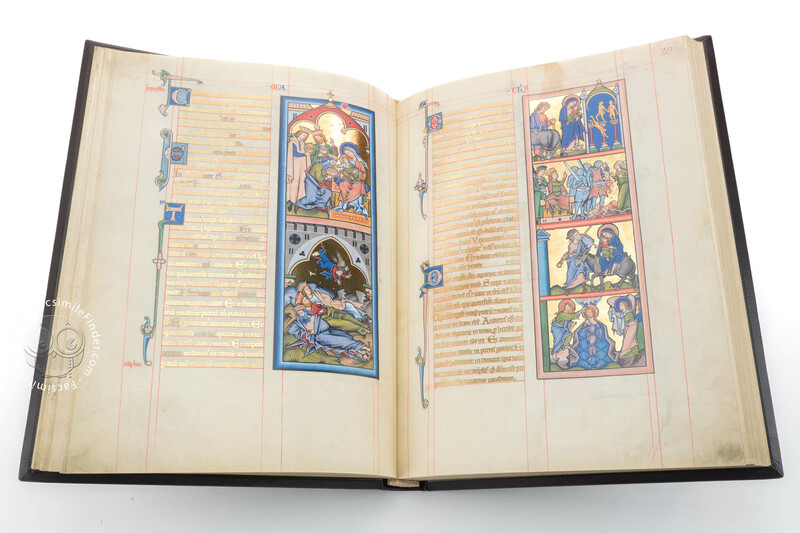 The Fine Art Facsimile edition is today fitted with a binding of ultra-fine dark leather with embossed lines and an inserted silver plate. 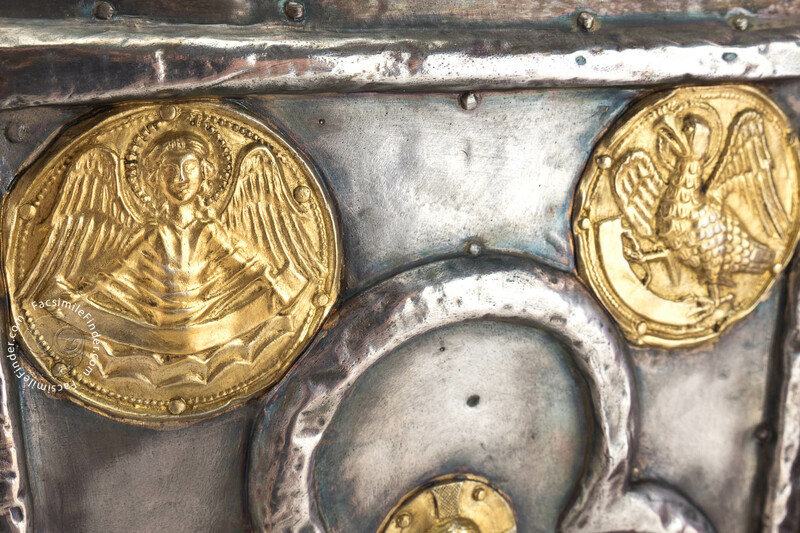 Five silver-gilded medallions showing the four evangelist symbols around a depiction of Christ in Majesty are applied on a silver plate as decorative elements. 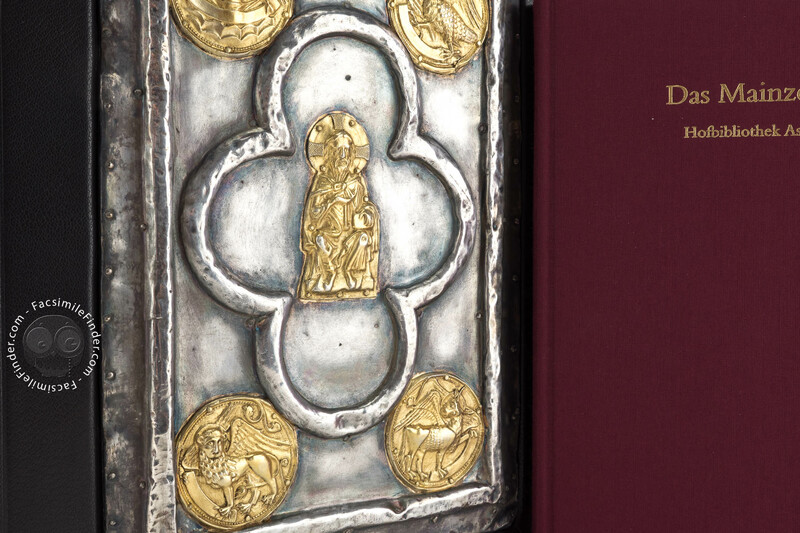 The volume is complete with a noble gilt-edge decoration on three sides.